We designed a simple and user-friendly signage catalogue that fits seamlessly with our client’s new brand, making the process of choosing appropriate signage more straight forward. 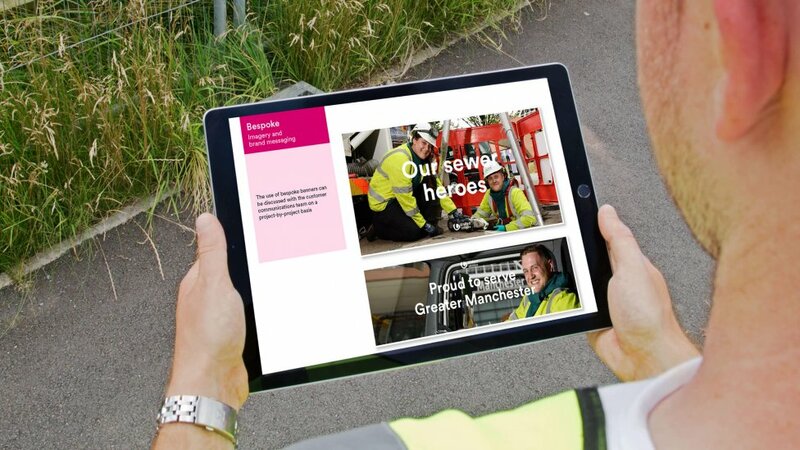 The work that United Utilities carries out has a significant impact on their customers and the community. That’s why they place so much importance on being proactive with their messaging, and on how that message is communicated. In turn, an easy to access signage catalogue plays a major role in a seamless chain of communication internally. Proactively communicating helps our client reduce the number of calls and comments they receive, with the subsequent increase in customer satisfaction. Fencing around their works not only enhances the look of their sites, it can also convey a positive message in an engaging and informative way. So it is important that project managers on site have access to a catalogue that allows them to choose the most appropriate signage in a quick and efficient way, minimising impact in time-sensitive situations. 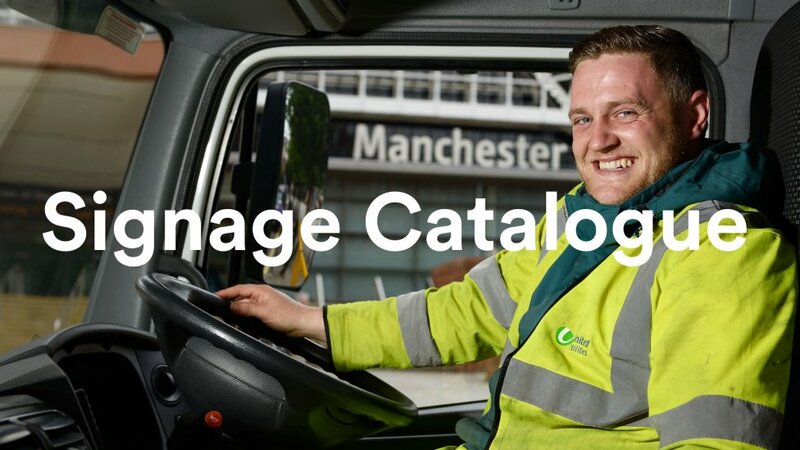 Having gained extensive experience over the last 10 years working with United Utilities on their large format signage, we were tasked with making their signage catalogue fit with their recently launched new brand. 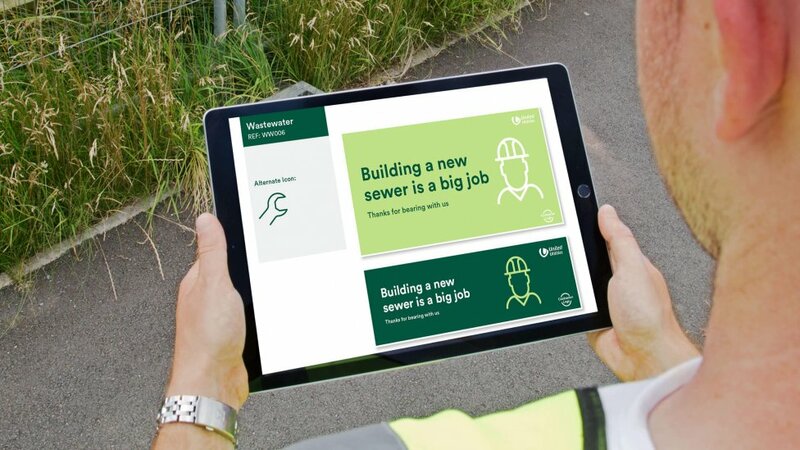 With the wide-ranging target audience in mind (site project managers, and ultimately customers), we created a bespoke and simplified signage catalogue that could be accessed both from mobile devices whilst on site, and also as traditional printed materials. The signage catalogue is essentially a compilation of designs that are attached to the fencing around their working areas. The catalogue contains technical specs for the different sizes and materials available, as well as multiple designs depending on the type of work and message required. Technical data is clearly laid out next to fresh illustrations or stunning imagery of the areas works are being carried out in. The catalogue is designed in a way that makes it easy for busy project managers to navigate through. The process of establishing a specific need for a site through to choosing the right solution flows smoothly. Our expertise in signage, from a design perspective and also from a technical and production point of view, really contributed to making this catalogue an accessible source of information. “We work hard to promote our investment work across the North West in a friendly, informative and engaging way.